Kraus-Anderson has begun construction on a new 17-story residential tower located at Portland Ave. at 9th Street in downtown Minneapolis. The 306-unit apartment residence has been named “H.Q.” Owned by Kraus-Anderson, H.Q. is part of the new comprehensive, mixed-use block development that also features Kraus-Anderson’s new home office, a 160-room hotel and Finnegan’s microbrewery. 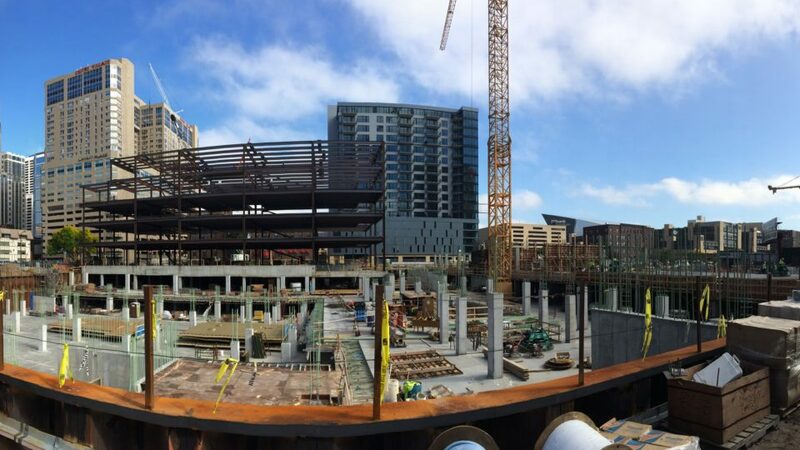 The start of vertical construction on H.Q. is one of two milestones achieved in October on the KA Block. On Oct 6, the company topped off its headquarters building with a beam signed by KA employees. Designed by Elness Swenson Graham (ESG) Architects Inc., the apartment tower’s signature design reflects the excitement of the developing urban community of East Town. H.Q. has a brick masonry base on levels 1-9 that relates to the brick and stone context found throughout historic Elliott Park. Levels 10-17 are clad in a contemporary, high-quality aluminum composite metal panel and the upper floors cant out at an angle to create a signature look. Street level walk-out units provide front porches with eyes on the street along Portland Avenue. Metal clad bays also provide articulation along the building façade. 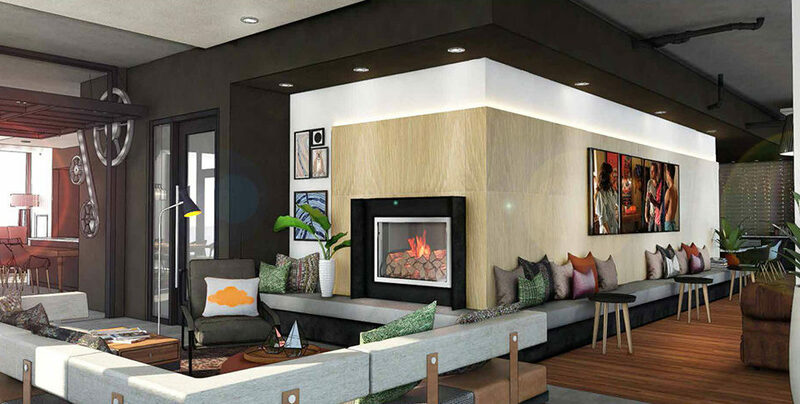 Inside, the highly transparent, two-story lobby will include a lounge with a bar and many seating areas, allowing residents to meet visitors or their neighbors for informal get-togethers or planned social events. A second-floor seating section, TV area and meeting space overlook the first-floor lobby-lounge. A generous fitness facility faces the courtyard and activates the west side of the first floor. The ninth floor hosts several other discrete “hang out” spaces, including a full demonstration kitchen and bar, multiple TV and game areas. The outdoor terrace will be home to a large social spa, several lounging and seating areas, and a cooking section, all with outstanding downtown and stadium views. 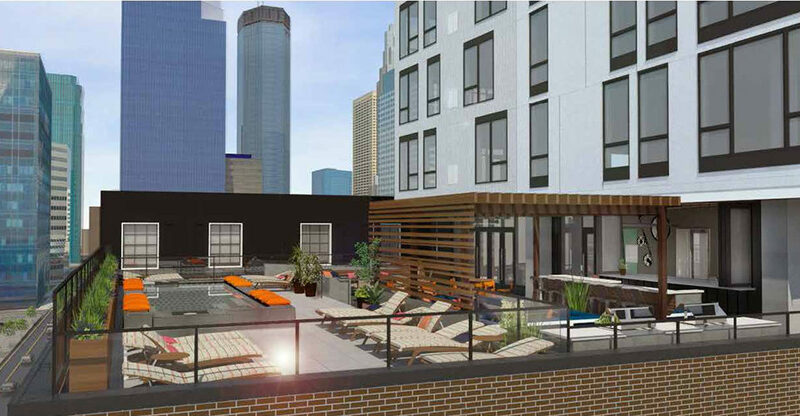 Property management will be provided by Saturday Properties, based in Minneapolis. Kraus-Anderson teamed with ESG Architects to develop the master plan for the entire block. Guided by the Downtown Neighborhood District, the plan provides significant enhancements for the City and the neighborhood, and for KA employees and business partners. It also addresses the Portland Corridor initiative that focuses on the neighborhood’s economic, aesthetic, historic and environmental needs, including Elliot Park’s master plan with considerations for housing and pedestrian-friendly streetscapes.